5mm chisel tip. Glue is blue when wet but turns clear when dry. Creates either a permanent or temporary bond. Versatile bonding, acid free, xylene free. For a permanent bond, use immediately after applying. 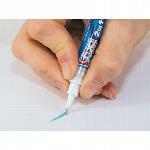 For a temporary bond, apply lightly and use after glue has turned clear.